We build powerful websites at a fraction of the market price for various industries. Select your industry above to see the best practice and pricings for your industry. *Customers have chosen to hide this price for privacy reasons. From their humble beginnings, operating out of their family farmstead in Brooks, Maine; Flame Grilling Products now have a 30,000 sq ft production and distribution facility in Waldoboro, Maine. After pioneering the grilling woods business in Maine, they decided to form a new company to reflect their ever-expanding commitment to supply their customers with the best grilling woods and with more varieties than anyone else. Flame Grilling Products faced a number of challenges, specifically: being found on search engines nationwide, fully communicating their brand lifestyle and stories, enabling smooth online shopping experiences, and maintaining customer relationships. When your website serves as the front door to your business, it's critical that it appear professionally designed, use high-quality images and have well-written, SEO-friendly text. These features create a sense of trustworthiness and professionalism. Additionally, it's important that the site is accessible on mobile devices without any errors. An increasing number of people are accessing the internet from mobile devices. CRM tools allow business owners to track and analyze customer behavior across their website. This knowledge allows you to create targeted marketing campaigns geared toward your most valuable customers. This could include special email offers, sales, and other deals. Moreover, many small businesses use online advertising tools like Google AdWords to drum up business. Your Ocoos platform allows you to monitor their success and making it easy to adjust if needed. Businesses like Flame Grilling Products depend on clients having the ability to conveniently make orders. Nothing is more convenient than being able to do that online, at any time, from anywhere. Customized integrations with popular platforms, such as EasyPost. These integrations provide label printing, shipment tracking, and customized shipping costs. The Ocoos platform offers a variety of online payment processing methods, including PayPal. Plus, you'll have the ability to offer discount codes, accept partial payments, set up recurring payments, and even allow customers to request a quote and pay later. Like Flame Grilling Products, most small businesses are juggling a number of clients, and it's necessary to stay in contact with them. Your online platform will include contact management tools that collect names, email addresses, physical addresses, and phone numbers organized in an easy-to-access system. "We initiated a search for a web design and help team to revamp our much outdated e-commerce website. After about fifteen interviews we selected Ocoos based upon speaking with current clients, services offered, ongoing support, and value for our investment. Needless to say, we are ecstatic about the results. Our new website is state-of-the-art with a platform that we can manage in house. Ocoos' concierge monthly package is top shelf. Each time that I reach out to them, I call it "sudden service"! And believe it or not, our website was up and running within six weeks of our first contact!" 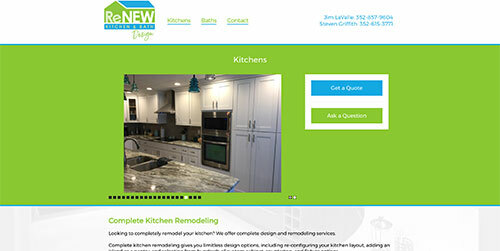 ReNew Kitchen and Bath is a company thats prides itself in getting the best work that they can for their customers. They make sure to team up with local companies to help provide them with the finest products and installers in the business. 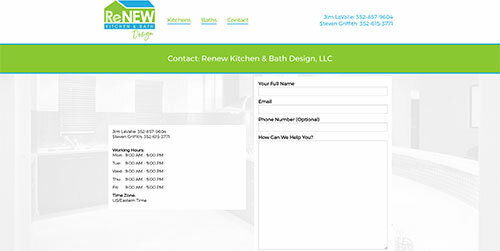 ReNew Kitchen and Bath faced challenges that included: being known in their local community, catering to their target audience, fully communicating their brand and stories, showing off the kitchens and baths they remodeled to an online audience, and maintaining customer relationships. When your website serves as the front door to your business, it's critical that it appear professionally designed, and incorporate SEO-friendly, well-written text, as well as high-quality images. These features create a sense of trustworthiness and professionalism. Additionally, it's important that the site is accessible on mobile devices without error, as an increasing number of people are accessing the internet from mobile devices. Moreover, many personal service businesses use online advertising tools like Google AdWords to drum up business. Your Ocoos platform allows you to monitor their success and adjust them if needed. Data shows that customers tend to begin their engagement with an online store through online messages. It is crucial for an online storefront that the customers can easily start a conversation with the store owner. Personal care services depend on clients having the ability to conveniently make appointments. Nothing is more convenient than being able to do that online, at any time. These online appointment scheduling tools also feature automatic reminders, helping eliminate missed or forgotten appointments. The Ocoos platform offers a variety of online payment processing methods, including PayPal. Additionally, you'll have the ability to offer discount codes, accept partial payments, and even allow customers to request a quote and pay later. Like Hefner, most personal services websites are juggling a number of clients, and it's necessary to stay in contact with them. Your online platform will include contact management tools that collect names, mailing and email addresses, and phone numbers and keep them organized in an easy-to-access system. Bullard & Mulkey faced a number of challenges, namely: being known in their local community, fully communicating their brand and stories, enabling smooth online scheduling, booking reminders, and maintaining customer relationships. An increasing number of people search for local attorneys online, and while using mobile devices. Your website often serves as a person's introduction to your law firm. This means you'll want a professionally designed site that features high-quality images and well-written, SEO-friendly text. Your website should also appear error-free across mobile devices, like smartphones and iPads. If you've put money toward online advertising campaigns, your Ocoos website offers tools that can track and analyze those efforts. This allows you to tweak or improve them as needed. Additionally, B2B co-marketing can help link your website with those of related businesses, expanding your marketing reach and building brand awareness. You don't have to be a mind reader to know what types of services your clients desire. CRM tools allow you to track and analyze user behavior on your site, which yields insights about which services individuals need most. With this knowledge, you can send targeted marketing campaigns or other business offers. Although you might not be available to your clients 24 hours a day, your website can be. By offering a scheduling tool on your site, clients can book their own appointments at any time. The Ocoos scheduling capability also features automatic reminders, which helps eliminate missed or forgotten appointments. Staying in contact with your clients is one of the smartest things an attorney can do to keep their business steady. An Ocoos website offers contact management tools that organize the names, addresses, phone numbers, and emails of your clients in an easy-to-access manner. Sid Levy, founding a member of Levy Family Productions®, copy-wrote and trademarked PEPITO in the U.S. and other countries in 1991. He never gave up his dream of turning PEPITO into a movie. Then, in 2008 he met the perfect partner to turn his dreams into a reality. That partner, Joaquin Rodriguez turned Sid’s idea into a script, then directed Yo Soy Pepito. Levy Family Productions faced a number of challenges, especially: being found on search engines, fully communicating their brand and stories, bringing their vision to life, and maintaining customer relationships. Being in the production industry means that Levy Family Productions must utilize the most up to date technologies to bring their work to life. It was only natural to collaborate and create a website that is modern and clean, yet simple and easy to navigate. Providing quick access to all social media platforms at all times - all being mobile optimized. Levy Family Productions needed a section to keep Yo Soy Pepito fans up to date with news and events. The production company now has the ability to easily post new articles that are related to their work and/or industry. Levy Family Productions is now able to run their Facebook videos through Ocoos, which will make it easy to update and showcase the advancements. In a connected world, we strive to make it simple to use technology to your advantage. It was very important for Levy Family Productions to protect their hard work. They have achieved it through an Intellectual Property Page, where they can show official documents that protect their rights as creatives. Easy to use CRM that is connected with their Contact page that will allow them to track relationships and enrich them with notes and data. This could help Levy Family Productions land their next project and continue doing what they love. Pamela Morgan has been a Registered Nurse for 28 years, 12 of which have been in the role of a Family Nurse Practitioner. Shortly after becoming a Nurse Practitioner, she had the opportunity to take over an existing Family Practice clinic, South Shore Family Health Center. To this day she has been passionate about the care and services her clinic provides to its patients. South Shore Family Health faced a number of challenges, especially: being known in their local community, enabling smooth online communication and scheduling, providing booking reminders, maintaining customer relationships, and EHR integration. Before a patient even schedules their first appointment at a doctor's office, they are going to research the practice online. Visiting the office's website will likely be their first impression of the practice. Your website should present a professional showcase for your practice. This means that it should be well-designed, feature high-quality images, and have well-written, SEO-friendly text. Also, because more and more people are searching the web using mobile devices, your website should also be mobile-optimized. As potential patients express interest in your practice, and current patients visit your site, you will want a platform that captures and organizes contact information, including: names, addresses, phone numbers, email addresses, etc. With this easily accessible information, you can stay in touch with new and current patients. Additionally, when new patients visit your site, you will want them to be able to download new patient documents and forms which they can fill out prior to their appointment. It's important your online platform has the ability to feature downloadable documents. Your office will be able to streamline all of its patient information by integrating Electronic Health Record (EHR) documents into its online platform. Plus billing patients and collecting payment is also made easier with a payment management system that incorporates multiple payment options. Many patients grow frustrated when they have to call doctors' offices to schedule their appointments, particularly if they need to call when the office is closed. To save your patient's frustration, your website should have the ability to offer online scheduling with automatic reminders. The reminders help eliminate missed or forgotten appointments. Many physician practices launch online advertising campaigns to drive awareness to their office. Your online platform should offer advertising optimization features that allow you to track and analyze your advertising campaigns. With this feature, you can adjust campaigns as needed. South Shore has taken advantage of the email remarketing capabilities within Ocoos to announce specials and target existing customers, as well as potential leads. Industry Authority – Lee Cain and Fred Lane, partners in ESI, have been in business together for many years. Together, they are involved in every aspect of the business and offer over 80-years of experience in providing consulting, design, operations, management, construction, and inspection services to local utilities. They guide ESI and its employees to provide old fashioned service, where the clients become a partner and excellent results make the difference. Engineering Solutions International faced a number of challenges, specifically: being found on search engines, fully communicating their brand and stories, having an employment portal, customer relationship management tools, and B2B referrals. All businesses are happy to spread awareness of their brand throughout the internet. Having a robust website that is SEO-friendly and appears in search engine results can help people discover your business. We have learned from many of our clients in the engineering sector that the primary purpose of their websites is to serve as a recruiting frontier. Therefore, it is important to enable employment application and resume collection on the website. For particular types of businesses, their website could serve as the primary showcase for their business. This means it is necessary to have a professionally designed website, which also features high-quality images and well-written, SEO-optimized text. Additionally, mobile optimization will ensure that your website appears on mobile devices without errors. Keeping track of your current and former clients and staying in touch with them helps you generate leads. Your online platform can help you organize contact information like names, phone numbers, and email addresses so that you can reach clients when you need to do so. Plus customer relationship management (CRM) tools help you identify your most valuable clients so that you are able to send targeted marketing campaigns their way. Small businesses often rely on one another for co-marketing, and the Ocoos online business platform includes the ability to have your website linked to partner sites. This cross-linking enables referrals and builds brand awareness. After reading through Marion Country’s health rankings for 2016, Steve Preston decided that it was time to make Ocala healthy again. Soon after, Next Step Fitness was founded. At Next Step Fitness, they don’t want to change the customer's body, they want to change the customer's life. Next Step Fitness faced a number of challenges, especially: being known in their local community, fully communicating their brand and stories, managing memberships, enabling online communication, providing booking reminders, and maintaining customer relationships. Having a website that is optimized across mobile devices and features a professional, clean design helps increase brand awareness and a sense of trustworthiness toward your business. People who want to book a session will often use your website to serve as the storefront for your business. This means it should include high-quality images and well-written, SEO-friendly text. Your search-optimized website will show up in search results across search engines like Google and Bing. Your members want to book classes with you, and it is necessary to incorporate a booking option directly onto your website so that they can do so quickly and conveniently. Additionally, you need to accept payment from those customers, so it is critical your site feature a variety of payment methods, including PayPal, and can also accept discounts and coupons. Many fitness company owners invest in online advertising campaigns to drive traffic to their website and business. Your online platform allows you to track and analyze those campaigns, and tweak them as needed to increase their benefit. Interacting with current or potential customers on social media outlets like Twitter and Facebook can positively impact your business. Still, it's tough to find the time to handle the task. Your online business platform offers tools that help with social media management. Staying in touch with current members is important to maintaining your business. An Ocoos website offers contact management features that store names, addresses, phone numbers, and emails so that you can easily reach your clients at any time. Moreover, customer relationship management (CRM) tools track and analyze your client's behavior on your website. This information allows you to create targeted marketing campaigns or special offers for your top clients. "I am not the easiest person to work with sometimes because I have high expectations. This being said, they have helped out every chance they could to not only get my website launched but also the upkeep of my website and social media sites. I recommend them because their customer service is top notch." Sleep Inn and Suites Wildwood - The Villages may be part of a major brand, but it's the personalized care that the staff brings to each guest's stay that helps it maintain its own identity. The Gold Award-winning hotel near the Villages in Wildwood ranks among the top 10% of Sleep Inn brand hotels worldwide and is rated an AAA Three Diamond property. Sleep Inn and Suites faced challenges that included: being found on search engines nationwide, fully showcasing the property, review integration and management, online bookings, and networking with local events and attractions. The Ocoos online business platform incorporates a number of features that are valuable to hotels, and which help businesses in the hospitality industry address their major concerns. Your hotel website might give new customers their first impression of your property, which means you'll want a professionally designed site with well-written text and high-quality images that appear error-free across mobile devices. One way Sleep Inn accomplished this was by providing a virtual tour of their property. Nothing gives customers more confidence on the quality of your services than positive reviews, especially a lot of them. It is necessary that your hotel website is able to collect all the positive reviews that distribute around the internet and integrate them on your site. In the meanwhile, in order to fight against malicious reviews, you need the total control over the review displays. By promoting local events and attractions, like theme parks or concerts, customers will consider your hotel as a destination in which to stay during their visit to the region. Finally, you'll want to integrate an easy-to-use reservation booking system that helps drive bookings to your website and away from OTAs (and their pesky fees). Ocoos' reservation tools are accessible on mobile devices and offer click-to-call and click-for-directions functionality. Keep the marketing buzz going by offering guests special deals or package options. You can use Ocoos' CRM tools to determine which deals might be appropriate for which returning guests, including local rates, group rates, extended stay pricing, and special packages like a girlfriends or couples getaway. You'll want your hotel website to engage your customers, and Ocoos offers tools that do just that, including the option to feature newsletters, blog content, social media management tools, and the ability to promote positive online reviews. Moreover, you'll want to track your successes and failures and make appropriate adjustments as needed - all of which are possible using Ocoos' analytics tools. Tone Up for Tune Ups is a charity fitness event focused on helping local families in need of car repairs. The event was created in 2012 out of participation in the Self Expression and Leadership Program through Landmark Worldwide. The project was supported by numerous people and was a huge success! To date, 19 families in the metro Detroit area have benefited from the money raised in Tone Up for Tune Ups. In 2015, Tone Up for Tune Ups became a 501(c)(3) non-profit organization. Tone Up for Tune Ups faced a number of challenges, namely: being known in their local community, fully communicating their brand and stories, enabling online donations, and maintaining participant relationships. When your website serves as the front door to your non-profit, it's critical that it appears professionally designed and incorporates SEO-friendly, well-written text, as well as high-quality images. These features create a sense of trustworthiness and professionalism. Additionally, it's important that the site is accessible on mobile devices without error because an increasing number of people are accessing the internet from mobile devices. Data shows that potential participants tend to begin their engagement with an online store through online messages. It is crucial for an online storefront that the potential participators can easily start a communication with the non-profit organizer. Non-profits depend on participants having the ability to conveniently make donations. Nothing is more convenient than being able to do that online, at any time, from anywhere. The Ocoos platform offers a variety of online payment processing methods, including PayPal. It's necessary to stay in contact with your existing participants. Your online platform will include contact management tools that collect names, mail and email addresses, as well as phone numbers and keep them organized in an easy-to-access system. "I have had a great experience with Ocoos. They are always responsive when I want some tweaks made to my website. I've had a great time working with each employee at the company that I've had contact with." Originally from Long Island, New York, Lois Lane moved to California in 1979 and lived there for 24 years. In 2005, Lois Lane discovered Ocala, FL and would never live anywhere else. Having held licenses in two other states and in Florida since 2006, her experience in the real estate market has been quite diverse. Whether it be Selling, Buying, or Leasing homes here in Marion County, Lois Lane has been in the Customer Service and Sales industry all of her life and has a proven track record of customer satisfaction. Decca Real Estate faced challenges that included: being found on search engines, fully communicating their brand and stories, MLS integration, and maintaining customer relationships. Ocoos offers Lois and other realtors an online business platform that is full of tools and features that can help them address and overcome common struggles. Many businesses looking to purchase commercial real estate begin their search online. 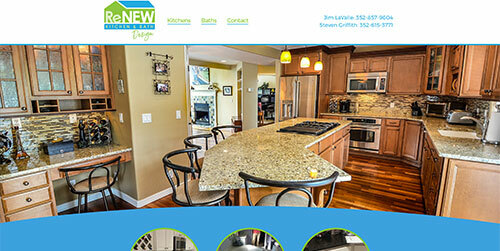 This means that your realtor website could offer them their first impression of your business. To help with this, your website should be professionally designed with high-quality images and well-written text. Also, because more people are using mobile devices to surf the web, it's important that your website be optimized for mobile. Data shows that customers tend to begin their engagement with an online store through online messages. It is crucial for an online storefront that the customers can easily start a communication with the store owner. Realtors always gain leads through current and former clients. Staying in contact with both is an integral part of business. An online business platform offers contact management tools that let you store and manage contact information, and send marketing emails to targeted client groups using customer relationship management tools (CRM). Keeping track of your real estate inventory can be tricky, and MLS access is a necessity for every realtor. An online business platform allows access to the MLS, and also offers inventory management tools that allow you to keep track of inquiries, visits, and more. Fielding calls from prospects that want to book appointments with you can be time-consuming. An online platform offers appointment scheduling tools with automatic reminders. Additionally, you can eliminate the need for some in-person meetings by offering the ability to digitally sign contracts. Experienced realtors recognize the value in online advertising, as well as co-marketing with related businesses to gain trust and generate leads. Your online platform offers the ability to track and analyze advertising campaigns, as well as use of B2B co-marketing tools. Mary's Cuban Kitchen and Bakery specializes in authentic homemade Cuban cuisine that has been serving the community for over 20 years. Mary’s Cuban Kitchen & Bakery is family owned and operated, featuring authentic Cuban food. The menu is based on family recipes for the authentic Cuban food Mary ate in her childhood in Cuba. Mary's Cuban Kitchen and Bakery faced a number of challenges, namely: being found in the local community, fully communicating their brand and stories, online menu and online ordering, maintaining customer relationships, and providing discounts and gift cards. When someone gets a hankering for a certain type of food or meal from a specific restaurant, they often go online to search for that restaurant's website. This means that your website often serves as the first experience potential customers have with your restaurant. With that in mind, you'll want a professionally designed site that gives an appearance of quality and trustworthiness. Well-written, SEO-friendly text and attractive pictures are also a must. Additionally, because an increasing number of people search for restaurants from their mobile device, your site should also be mobile optimized. A restaurant owner's days and nights are consumed with running their business. They often don’t have time to spare for figuring out how to strengthen relationships with customers. An online platform includes contact management tools so that you can store contact information from your clients, like names and addresses. Additionally, you can use customer relationship management (CRM) tools to analyze user behavior on your website and send targeted marketing offers to your best customers. Potential and current customers don't just want to research restaurants online, they also want to be able to order online. An online business platform from Ocoos offers online ordering, which is quick and convenient for your customers. Often restaurants offer discounts to their customers, as well as special promotions. Furthermore, many customers also want to purchase or pay with gift cards. Your online business platform allows you to have a variety of payment options and includes a discount manager. The Ocoos platform offers the ability to track and analyze online advertising campaigns, so you can adjust them as needed. Additionally, it offers tools to allow you to manage your social media accounts and stay in touch with your customers. Florida's waterways beg to be explored. Ozello Boats, LLC is a family owned, local Marina-based business specializing in boat tours and rentals. They offer daily Airboat, Scallop, and Manatee tours, kayak (fishing) rentals, and boat storage. They help share the state's nature and culture while promoting wildlife preservation and water conservation. Ozello Boats, LLC faced a number of challenges, especially: being known in their local community, fully communicating their brand and stories, enabling smooth online scheduling, booking reminders, and maintaining customer relationships. Having a website that is optimized across mobile devices and features a professional, clean design helps increases brand awareness and a sense of trustworthiness toward your business. People who want to book a tour will often use your website to serve as the storefront for your business. This means it should include high-quality images and well-written, SEO-friendly text. Your search-optimized website will show up in search results across search engines like Google and Bing. Staying in touch with current clients is critical to maintaining your business. An Ocoos website offers contact management features that store names, addresses, phone numbers, and emails so you can easily reach your clients at any time. Moreover, customer relationship management (CRM) tools track and analyze your client’s behavior on your website. This information allows you to create targeted marketing campaigns or special offers for your top clients. Your customers want to book tours with you, and it's necessary to incorporate a booking option directly onto your website so that they can do so quickly and conveniently. Additionally, you need to accept payment from those customers, so it is critical that your site feature a variety of payment methods, including PayPal, and can also receive discounts and coupons. Interacting with current or potential customers on social media outlets like Instagram, Twitter and Facebook can positively impact tour operators’ businesses. Still, it's tough to find the time to handle the task. Your online business platform offers tools that help with social media management. Data shows that customers tend to begin their engagement with an online store through online messages. It is crucial for an online storefront that the customers can quickly start a communication with the store owner. Many tour operators invest in online advertising campaigns to drive traffic to their website and business. Your online platform allows you to track and analyze those campaigns, and tweak them as needed to increase their benefit. Groups or franchises typically require heavy custom development to fit their particular demands. Ocoos is equipped with a world-class R & D team lead by the PhDs and Masters from Havard and University of Florida. Please contact us for your custom demands. We are not limited by the industries listed on our case studies. Request a call below or give us a call at (844) 669-3366 to figure out the best solution for your business.